Nick Brooks drew my attention to this article about the three way relationship between science, art and imagination when it comes to our response to climate change. My thought, as someone who plans to write a novel about climate change (I have written a few short stories about it, including Rat Island, which you can read here) is that the difficult three-way link to pull off is between (a) depicting just how bad the future could be if climate change takes hold (b) nevertheless encouraging hope rather than resignation (a lot of people are simply resigned to climate change, much as they are resigned to their own deaths) (c) managing to do both these while actually being an engaging story. Over the last few weeks, I’ve actually heard quite a few things that have made me feel encouraged about the possibilities for the future. The Swansea tidal barrage has moved a step nearer being a reality (harnessing a moon-powered energy source that that has the potential to generate a good deal of the world’s electricity). A new kind of aluminium battery, durable and capable of being charged very quickly, has been developed (electricity needs to be more storable and more portable if we are going to move away from fossil fuels for power generation and transport). A new way has been developed of producing hydrogen in a carbon-neutral way from plant waste (hydrogen being another potential clean and portable power source). It’s very easy to pick holes in these kinds of developments as solutions to our problems. They can be dismissed as tokenistic or impractical gestures in the face of the scale of the task to be accomplished, and of course many of them will prove to be blind alleys, like steam cars or digital music cassettes. But blind alleys are inevitable in any dynamic evolutionary process. It seems to me that what we have in front of us are the early prototypes of technologies that, when developed and linked up together, could take us into a post-carbon economy. Are the technical challenges really so much greater than those involved in developing the modern car from its primitive forebears, or the modern airliner from the Wright brothers’ ramshackle flying machine? 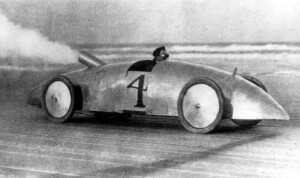 Stanley steam-powered racing car 1903. Public domain image. I’ve no idea how to make these hopeful developments into interesting fiction, or how to combine them with dire warnings about what will happen if we don’t puruse them, so I’ll just lay them out right here. I guess technology and fiction just don’t necessarily mix. There’s plenty of fiction about space travel, because it can be used to create extreme and exciting scenarios, but how much interesting fiction has been written about communication satellites, the one application of space technology which most of us actually use? Chris, here are some initial thoughts. There may be more later. One of the issues here is that, while there are a host of technologies that could address climate change, they almost certainly won’t be rolled out fast enough to stop sufficient warming to cause us major problems. We’ll be running to catch up with technological solutions. We might be able to reduce the magnitude of climate change by removing carbon from the atmosphere, or by reducing solar radiation (aerosols, space mirrors, etc.) But we won’t be able to restore the status quo ante. So the world will change, whatever we do. But perhaps it won’t change to such a catastrophic extent that human civilisation will completely collapse. So we might balance the hope that we can prevent a worst case scenario with the reality that the world will change – sea-levels will continue to rise, temperatures will go up, and weather systems and ecosystems will change and migrate; some will transform or collapse. If we go down the solar radiation management, rather than the carbon-removal route, then oceans will continue to acidify. The point is, it’s possible to envision a world reorganising and recreating itself as a result of action that avoids total catastrophe, but doesn’t prevent things from changing in very challenging ways. I haven’t read loads of cli-fi, but where I’ve encountered it, climate change doesn’t really drive the story, but provides part of the context, and is part of the world building. Often the stories that use climate change take place in a world already changed, rather than one which is changing (a dodgy distinction, I know). Climate change helps the writers build a world that’s both sufficiently familiar for readers to relate to, and sufficiently different to be somewhat alien. But that’s just one approach to the use of climate change, and one that doesn’t really tackle the subject in the way that I suspect you’re interested in doing. No, Nick, I do fully appreciate that these technologies won’t be rolled out fast enough to stop climate change. Nevertheless, I derive some hope for the fact that technologies are slowly unfolding that could at least turn off the carbon tap at some point in the future. We’d still be in the hole, but at least not digging anymore. I think the approach my novel would take is similar to the ones you’re describing: ie the climate change would provides a future world and an opportunity to think how human beings respond to a rapid deterioration in their environment. I don’t think it’s possible for a novel to provide a blueprint for action: and anyway I’m not qualified to offer one. But, as someone who writes about imagined futures, I feel I’d like to contribute to general awareness that there’s no point in thinking about the future without thinking about climate change.